Nursing unit manager Grace Tang and registered nurse Lani Ibones with patient Barbara Reynolds. A patient from Blacktown Hospital’s Cancer and Haematology Centre has provided a heartfelt $1000 donation to the centre today. Barbara Reynolds, who is currently being treated at the hospital, wanted to show her appreciation for her care. “I wanted to show my appreciation of my journey within the centre,” she said. Barbara’s workplace (Ventia P/L in Chatswood) held morning teas and raffles raising $500, and her husband’s workplace (BT Civil NSW P/L) doubled the donation to make it $1000. 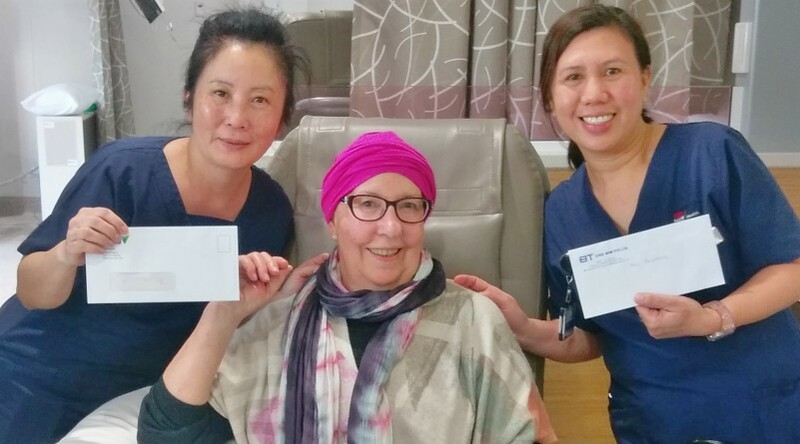 Barbara presented the donation to the centre’s infusion nursing unit manager Grace Tang. We wish Barbara all the best with her treatment and recovery!